But afterwards, back in Wilmington we uncorked a bottle to accompany us into the night. 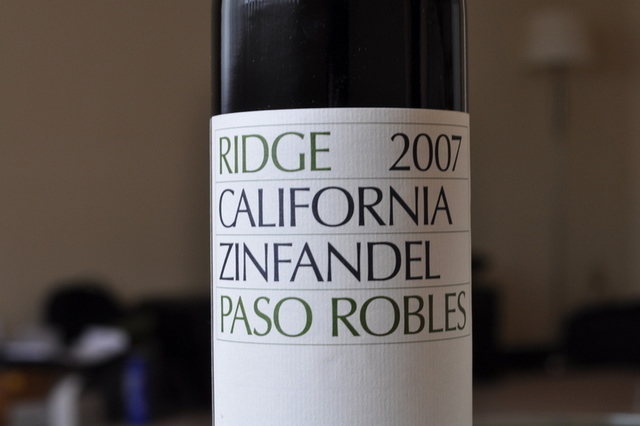 The 2007 Ridge “Paso Robles” Zinfandel. 100% Zinfandel. I had had a bottle of the ’06 Paso Robles and loved it. We opened it and drank it as the night slipped away and the morning, with its prospect of her leaving, edged ever closer. The Ridge was a light color, with very pronounced acidity but good firm tannins. It was zippy, with cranberry and bright red fruits underlined by darker notes of prune. A hint of menthol and pepper. I don’t know when I’ll see her next, but I do know that when I do, there will be a bottle of wine. Nice writeup. I love Philadelphia, except for the state wine monopoly, which reminds me of Canada. I recall having several excellent meals there when visiting for an academic conference many years ago. As for the Ridge, it is not my favourite of theirs, but I love their approach to zin. Great prices and real wine with personality. It may not be perfect, but it tastes like someone I’d want to meet (on reflection that sounds dodgy). Philly is one of my new favorite American cities. As I’ve told others, it has a blue collar exuberance I quite like. There are, however, some pretty shady areas (just like every other major city, I suppose). Charles Shaw? It has similar appeal to several of the eateries on Telegraph Ave.